Air Force, Army, Coast Guard, Marine Corps, Navy. All (US) Allied Military agencies are applicable. 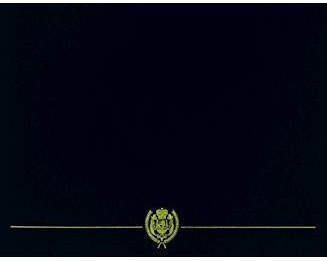 Department of State and Central Intelligence Agency personnel are applicable. An unaltered photocopy of your DD-214 displaying your service during the Alert period. 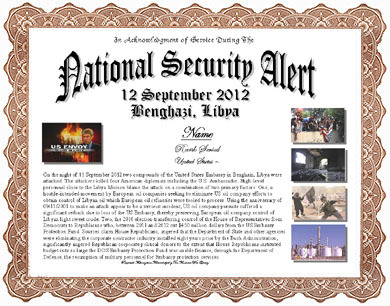 On the night of 11 September 2012 two compounds of the United States Embassy in Benghazi, Libya were attacked. The attackers killed four American diplomats including the U.S. Ambassador. High-level personnel close to the Libya Mission blame the attack on a combination of two primary factors: One, a hostile-intended movement by European oil companies seeking to eliminate US oil company efforts to obtain control of Libyan oil which European oil refineries were tooled to process. Using the anniversary of 09/11/2001 to make an attack appear to be a terrorist incident, US oil company pursuits suffered a significant setback due to loss of the US Embassy, thereby preserving European oil company control of Libyan light sweet crude. Two, the 2010 election transferring control of the House of Representatives from Democrats to Republicans who, between 2011 and 2012 cut $450 million dollars from the US Embassy Protection Fund. Sources claim House Republicans, angered that the Department of State and other agencies were eliminating the corporate contractor industry installed eight years prior by the Bush Administration, significantly angered Republican corporate political donors to the extent that House Republicans instituted budget cuts so large the DOS Embassy Protection Fund was unable finance, through the Department of Defense, the resumption of military personnel for Embassy protection services. Authorized to Department of State, Central Intelligence, Active Duty and Ready Reserve Service service during the Alert Period.